Our research interests are mainly focused on structural analysis of specimens of biological relevance by means of electron tomography and image processing. Our main project is the study of the neuronal sub-cellular architecture and exploration of the structural alterations under pathological conditions in neurodegenerative diseases. 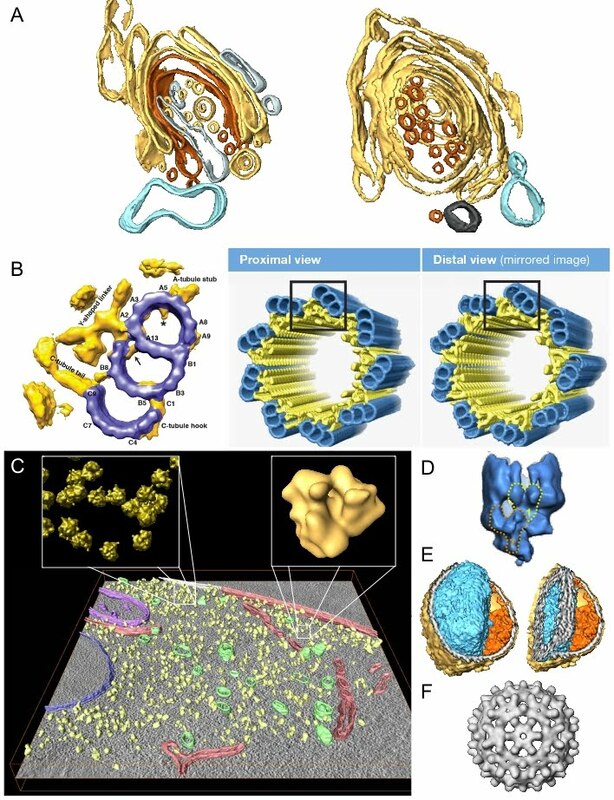 We are also interested in structural elucidation of the microtubule organizing centre (MTOC), an important and complex cellular organelle in eukaryotes, in close collaboration with Dr. Sam Li (UCSF). We also collaborate with cellular and molecular biology groups in other experimental structural studies. An important pillar of our research is the development and application of computational methods and tools for electron tomography, and their implementation with high performance computing techniques to make them fast. Electron tomography (ET) and image processing are the central tools in our research. ET has emerged as a powerful structural technique to address fundamental questions in molecular and cellular biology. It makes possible visualization of the molecular architecture of complex viruses, organelles and cells at a resolution of a few nanometres. ET has a unique ability to bridge the gap between high resolution structural techniques (e.g. X-ray crystallography, single particle cryoEM). ET allows integration of the structural information derived from the different techniques and gathered at multiple levels of the biological complexity so as to provide a comprehensive description of the cellular function in molecular and even pseudo-atomic detail. In ET the biological sample is imaged with an electron microscope, and a series of images is taken from the sample at different views. Afterwards, a number of computational stages follow, which are required to first compute the 3D volume, or tomogram, and then to post-process it and interpret it. Therefore, image processing plays a fundamental role in structural studies by ET. A. Architecture of Golgi structures that sequester cytoplasmic contents in neurons for their potential degradation, as revealed by electron tomography of brain tissue prepared with cryofixation+freeze-substitution techniques (Fernandez-Fernandez et al. J Cell Sci, 2017). B.Three-dimensional structure of the basal body triplet revealed by electron cryotomography and subtomogram averaging at 3.3 nm resolution, and model for the whole basal body. (Li et al. EMBO J, 2012). C. 80S ribosome macromolecular atlas from a vitreous section of a Saccharomyces cerevisiae cell using electron cryotomography and image processing. Mitochondrion, purple; vacuole, blue; endoplasmic reticulum, pink; cell membrane, white; unidentified vesicle structures, green; unidentified macromolecular complexes including putative ribosomes, yellow. Top panels show a putative polyribosome cluster and an average ribosome. (Pierson et al., J Struct Biol, 2010). D. Three-dimensional structure of the gamma-tubulin ring complex revealed by electron cryotomography and subtomogram averaging at 4 nm resolution (Kollman et al. Nat Struct Mol Biol, 2015). E. Structure determination of Vaccinia virus with electron cryotomography and image processing (Cyrklaff et al. PNAS, 2005). F. Visualization of the structure of Hepatitis B virus with electron cryotomography and new computational methods for determination and correction of the transfer function of the electron microscope and subtomogram averaging techniques. (Fernandez et al. Ultramicroscopy, 2006).